MPI’s Auto-Print® Unit-Dose Packaging System is a complete bar coding packaging solution for oral solid medications. This high-performance, durable system eliminates the need for manual packaging and sorting of medication and is designed for simple maintenance and easy operation, assisting the pharmacy in decreasing packaging costs, increasing operational efficiency, and reducing medication errors. For over three decades hospital pharmacies worldwide have been relying on the Auto-Print for their packaging and labeling needs. MPI’s Auto-Print packaging system is manufactured to adhere to strict technical guidelines to assure optimum performance of the packaging equipment and safe packaging of oral solid medication and adheres to strict quality control procedures throughout the manufacturing process. The MPI-certified consumable materials used in conjunction with MPI’s Auto-Print packaging system were developed exclusively for use in MPI’s packaging systems and were extensively tested to assure there is no degradation to the medication during the packaging process. Multi-layered composition of the consumable materials, combined with our built-in low sealing temperature process of 98° C, assures that a safe, sealed, tamper-proof unit dose package is created each time and is easy to open when it is time to administer the medication. MPI’s proprietary printer design, incorporated into the Auto-Print packaging system, was developed to work exclusively with MPI’s consumable materials to provide a clear, legible print of all medication information including a scannable barcode. The processes by which these materials are manufactured, and the products that are used to create the materials, are FDA registered for use in drug packaging and as such, meet the USP standards for Class A and Class B medication packaging. In accordance with the guidelines set forth by the U.S. Pharmacopeia, a one-year-beyond-use date (BUD) can be affixed to the repackaged product, or the remaining expiration date of the product, whichever is shorter. MPI has developed consumable materials that meet the Class B requirements set forth by the USP for moisture permeation and Class A requirements for light transmission. The package sealant and adhesive layers conform to the FDA requirements for use in direct food contact providing for contact surfaces which are not reactive, additive, or absorptive. Space Requirements: Sturdy and level countertop, height between 28″ and 36″ for comfortable working conditions. Clearance above the counter should be 18″ to 24″. Minimum depth of 18″ with 4′ to 5′ minimum counter space in length. Packager connects to the computer via a 10′ USB cable that is supplied with the packager. The Auto-Print requires two (2) 120V outlets. The Oral Solid Feeder (OSF) requires one (1) additional 120V/230V outlet. Allow additional room and electrical outlets for your computer. Barcodes Supported: All linear and 2D barcodes are supported. Chutes/Disks: The Auto-Print ships standard with two (2) pill chutes—1″ Large and 5/8″ Small—and two (2) feed disks—Round/Tablet (1″) and Oblong/Capsule (1″)—to accommodate standard size tablets and capsules. Additional pill chutes and feed disks are available for purchase to accommodate non-standard size tablets and capsules. Variable Length Option: The optional variable length feature adds the capability to change the package length as needed. Pre-loaded software templates are available for each standard package size and software label preview accurately represents package size. Standard available choices for variable length packages include: 1″, 1 1/8″, 1 1/4″, 1 3/8″, 1 1/2″, 1 7/8″, 2 1/4″. MPI has developed three distinct MPI-certified consumable materials for exclusive use in MPI’s Auto-Print packaging system to create the unit dose package, Auto-Print SUPERTHERM® thermal paper, which can be combined with Auto-Print SUPERCEL® film or Auto-Print SUPERFOIL®. The combination of MPI-certified consumable materials to create a unit-dose package assures no degradation to the contents or the package seal integrity. The built-in low sealing temperature and built-in printer provides assurance to the packaging pharmacy that all medication will be adequately protected from external environment effects such as light or moisture and a that a clear, legible, fully sealed unit-dose packaging is produced every time. The combination of packaging oral solid medication with MPI’s Auto-Print packaging system and our exclusive MPI-certified consumable materials, coupled with the advanced barcoding capabilities and configurations available in MPI’s Pak-EDGE™ software, provide our customers with the continued confidence that each unit-dose package will be produced in adherence to industry guidelines for light, moisture, and sealing. A safe, tamper-proof unit dose package containing detailed medication and barcode information will be delivered to the bedside each and every time, ensuring patient safety. Packaging bulk medication into unit dose is more cost effective than buying products pre-packaged from the manufacturer. 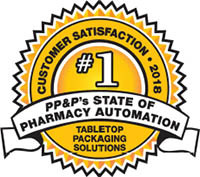 Produces sixty (60) packages per minute, eliminating the need for manual packaging and sorting, thus freeing up pharmacy staff to focus on other tasks. Additional efficiency can be achieved with the optional Auto-Print Oral Solid Feeder (OSF) attachment for packaging bulk medication. Accurate inventory control and maintenance of stock levels maintained through the sequential numbering feature. Barcode and Scan Check: Scanning bulk bottle before packaging verifies proper drug. Barcode Verifier: Scanning each package after packaging the unit dose container assures that the barcode can be accurately scanned at the bedside. Tall-Man Lettering: Helps reduce “looks alike, sounds alike” errors. Colored Materials: Six (6) different colors of Auto-Print SUPERCEL® are available for color coding of expiration dates and controlled medications. All colored materials offer light-resistant packaging. One year limited warranty included. Extended warranty and preventative maintenance agreements available. MPI continually stays abreast of changes in packaging technology, standards, and guidelines and employs the highest standards of excellence to develop and deliver high-quality, reliable products. Recent product advancements have been incorporated into the Auto-Print® such as a higher quality printer, new digital heater and a more powerful processor. Our products comprise the most current features and functionality that contribute to saving patient lives through error-free medication packaging. Article: "Packaging Practices at a Small Community Hospital"
Article: "Cost and Time Savings with a Tabletop Unit-Dose Packager"